2 How to remove a pocket door without removing the trim? Pocket doors are quite a familiar part of modern homes. But sometimes, they get worn out, and you are in the essence of replacing it with a new one. But when you get on the track, the process seems not to be so easy. And you need help in case you’re new to such operations. For removing and installing a new one, you will need some top-quality pocket door hardware kit. In today’s post, we’re going to explain the exact process on how to remove a pocket door. We’ve split the post into two sections where we’ll be guiding you through removing the door with or without removing the trim. The first and foremost step of removing the pocket door is to remove the trim. Start with pulling it on the direction towards you to pull the rollers from its place. The tool that you have to use in this place is a quality stiff putty knife. If you don’t have such a knife, you can use a pry bar instead. After removing the trims, there will still be some screws on the track, and you need to remove them all. In this regard, you need to make an opening on the wall. Use a stud finder to locate the internal frameworks and mark that with a pencil. Afterward, you need to cut the opening using a wallboard saw. Once done, you have to create space to house the screws or drilling machine. Make sure that there is not any damage to the cutout. There is a hidden part inside the track of your pocket door. Access that portion and remain all of the screws. That will eventually let you pull out the track. Rest of the hardware will include a roller that can be found right on the door panel. After unscrewing all the screws, you should be able to take out that roller. Now, place the new hardware in the place of the old one, which is also called re-hanging the door. The tool that you need to do is a pry bar and a shim. These will help you to hold it at the place. We’re into the next stage now, where you need to place the new hardware. In case of a new pocket door hardware, you may not find it perfectly suitable for the door dimension. Try to adjust the dimension accordingly. There are instructions provided by the manufacturer, and that’s where you will find the help. So far, you should have created space and hardware to set up the new pocket door. Before that, you need to replace the trim, if you want your trim to be unique. Along with the trim, you have some damages at the wall that you might like to replace. Mainly, replace the access door that you have just cut on the wall. To get done with this step, you need to have a pocket door pull that matches the exact size of the previous one. Fill the old holes and use wood filler to create an entirely new surface to work on. To operate with the pocket door properly, you need to create a new latch. The tools that you will need are- a Forstner bit and a sharp utility knife. With the forstner but, you have to drill a series of holes. And with the top-rated utility knife, you need to set the latches in place. We are done with the process of placing a new pocket door in the place of the old one. Now, check whether the dimensions are matched precisely or not. If you find any mismatch, you may look for adjustment where necessary. 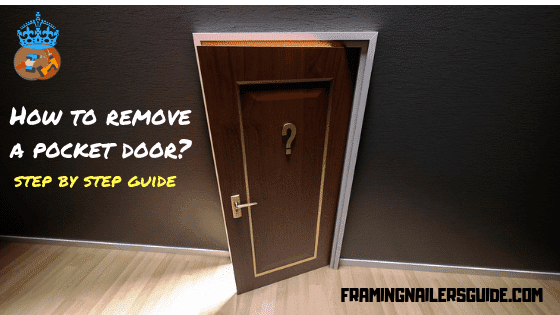 If you have gone through the previous steps of removing a pocket door and setting a new one up, you might have noticed that pulling the trim out is one of its very first steps. But there are some cases when you don’t want to do that. Especially when you don’t want to take out the trim, and you don’t have a new one to replace that. How to remove a pocket door without removing the trim? Here at the starting point; you need to remove the jamb stops. Jamb stops are located at both head and the J-shaped single track. By the way, remove jamb stops only from that side of the door which is faced towards the closed side of the entire track. If you are lucky enough, the stops which are attached with the screws will merely be backed out. If you are successfully done with the previous steps, take off the stops. After that, check whether you can swing the door out right from the bottom of it. You should also be able to lift the door slightly. That will eventually disengage the roller back. If you’ve reached this far, that’s great. Now follow the previous section and find instructions regarding placing the new pocket door. Everything should be the same as we’ve described in the last section. Great! You’ve just gone through the steps in this how to remove a pocket door guide to place the new pocket door in place of the old ones. We want to remind you that taking off the pocket door without the trim might lead to slight damages on the frame itself. Be ultra careful and take helping of an expert if necessary.